When you think of visiting Las Vegas, your probably think of casinos, grand hotels, glitz and glamour and of course dining experiences. Gone are the days where you could dine on $5.99 at an all you can eat buffet. It may even be tough to eat for $5.99 at McDonalds now. So that makes choosing your dining experiences or where you eat a little more important. 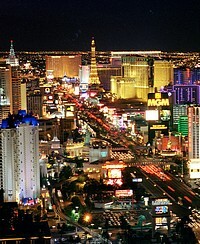 After all it is a significant part of your trip to Las Vegas! Each time we visit we go back to our old favorites and try new restaurants. We usually try restaurants based on recommendations from people we meet in Vegas, or through reviews we have read. One tip to remember when dining in Las Vegas is that the portions are huge. We usually try to order the same thing and share it. Otherwise there is just too much food and we will either leave it over or worse eat it! Below are some of our favorites organized by type of restaurant. We like a variety of food and I will tell you the good and the bad of each. If you have a favorite restaurant in Las Vegas that you think we should try or that you would recommend to others, please click here to Review a restaurant in Las Vegas. Las Vegas Restaurants - Ready for a Burger? The Burger Bar at the Mandalay Bay have some of the best burgers in town! Warren and I are burger fans. At least once a trip to Las Vegas we crave a burger for lunch. 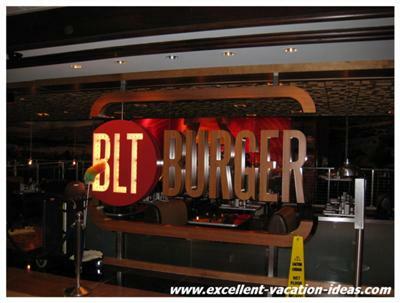 During our stay in September 2008 at the Mandalay Bay, I recommended that we try the Burger Bar in Mandalay Place Shopping area between the Mandalay Bay and Luxor. I had read a great review and we were starving so off we went. We were told that we would have to wait (even though the restaurant wasn't busy) by a not so nice hostess (the only bad point of the experience) - this led to us sitting at the bar waiting for a table. This is where we met Ingrid. Ingrid turned our burger experience into the best burger in Las Vegas for us. She greeted us with a smile and was so friendly that we decided to eat at the bar. She offered all sorts of suggestions and was all around amazing. She even offered Warren a few tastes of the different beers they had on tap. The best part of our experience with Ingrid is how she made us feel welcome and she was so personable. The Burger Bar is lucky to have her! We ended up with the Kobe Burger, rings and skinny fries. You get too choose pretty much EVERY part of your burger. From the bun to the type of meat to the toppings (different kinds of bacon, mushrooms, cheeses...). And then of course there are the side choices - onion rings, skinny fries, sweet potato fries. Then your condiments - ranch dressing (my fav), BBQ sauce, Ketchup, mustard, mayo and on and on. We loved the burger and the experience so much that we went back in February 2009 and saw Ingrid again! The food was amazing and the service top notch (even though it was busier). This time I had an angus burger with onion rings and it was just as awesome and hit the spot! We will go back again! "The great thing about certain restaurants in Las Vegas is that they can be open during the late hours and you can still expect great food. Having a desire for a burger one late night, we headed to Stripburger on the corner of Las Vegas Blvd and Fashion Show Dr. The burgers are offered at a reasonable price, as were the milkshakes. For appetizers we ordered the Pickle Fries with Ranch Dip. Best substitute for fries anytime. And the hot fudge milkshake I had was superb. For the best burger deal at reasonable prices without the Fast Food setup, the Stripburger is the best place for it. http://www.lasvegasstripburger.com Menu can be downloaded. I wouldn't recommend eating the printout." Do you have a favorite Burger restaurant in Las Vegas? Share it in our Las Vegas reviews? "A casual dining experience, located in the Mirage Hotel. Excellent Burgers (every type imaginable) and amazing shakes - made to order, if you can dream it, they can make it :)"
The Grand Lux Cafe is located at the Venetian (and there is a new location in the Palazzo). This is our favorite 24 hour hotel type cafe. 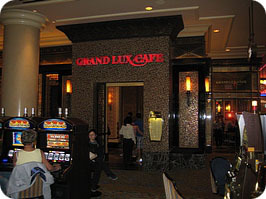 The Grand Lux is the sister restaurant to the Cheesecake Factory and the food is just as good if not better. There are locations in other states in America (I have seen them in Florida and Chicago). We prefer the Grand Lux at the Venetian (over the Palazzo) as you can sit "outside" in the casino and watch the people walk by. The portions are HUGE and the food is always good. Most of the time Warren and I will share something. The salads are huge, and the Ahi tuna is really good. You can have the brunch or breakfast buffet (which is also good) or order from the menu. Make sure you order the home baked cookies for dessert. If you don't have enough room to eat them, you can take them back to your room for later. And of course they also have some varieties of the Cheesecake Factory cheesecake. Favorite Dishes: Melanie - Double Stuffed Potato Spring Rolls. Warren - Chicken Caesar Salad. The Augustus Cafe is a little more expensive but the food is worth it in our opinion. We love breakfast here. You can have almost any type of eggs, and some new ones thrown in. Most meals are large enough to split between 2 people. Sometimes we do find the service slow, but the food is still good. 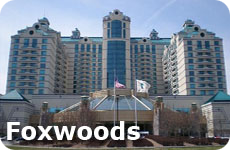 Try to request a table near the lobby as you can watch the people go by while you eat. Unfortunately this cafe has closed. We were very sad to see that when we visited in August of 2011. They are now putting in a Popular Chef restaurant. 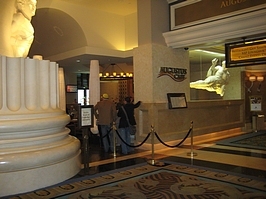 Unfortunately as of October 2011 (during one of our trips to Las Vegas) we discovered that the Augustus Cafe has closed and has been replaced with a celebrity chef restaurant (as most of the major hotels have) by Chef Michel Richard. It is called Central and is basically American type food with a twist of French to it. Do you have a favorite 24 Hour Cafe restaurant in Las Vegas? Share it in our Las Vegas reviews?